In this article, we’ve created a Safeway customer satisfaction survey guide. In this guide, we will go over all the steps, requirements, and rules you must follow to take the Safeway survey and enter the Safeway sweepstakes. We will also include links and explanations for any problems that may arise during the Safeway survey at www.safewaysurvey.net. As a reward for providing feedback and helping them improve their services, Safeway has created a sweepstakes that award winners with a $100 Safeway gift card. There are 20 prizes being given out each month. You can take the survey and become eligible for the sweepstakes every 15 days. If you are one of the winners, the company will contact you to send you the prize. Keep in mind that the prizes are non-transferable, and they consist only of what is specified, namely a Safeway gift card. You cannot exchange the gift card for cash. Must not work for Safeway or any of its affiliates. Must not be an immediate family member or live in the household of an employee of Safeway or any of its affiliates. Must be a legal resident in one of the following states: Alaska, Arizona, California, Colorado, Washington DC, Delaware, Hawaii, Idaho, Maryland, Montana, Nebraska, New Mexico, Nevada, Oregon, South Dakota, Texas, Virginia, Washington, or Wyoming. Visit the Safeway survey website. 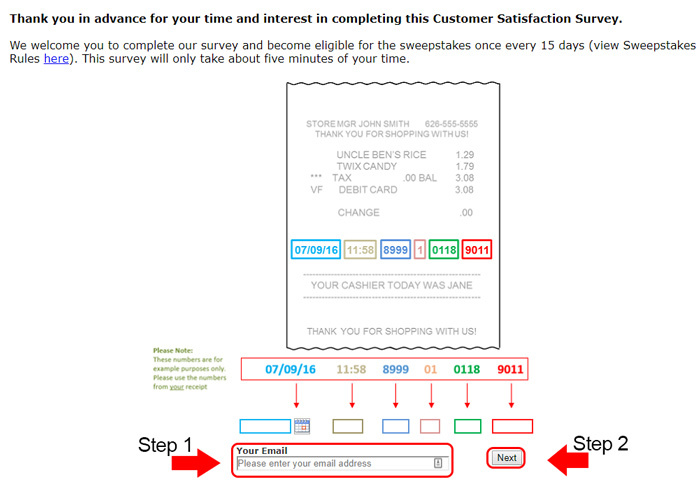 Enter the survey code into the boxes at the bottom of the page. The first numbers should be the date, the second should be the time, and the remaining four sets of numbers are the code. Enter your email address so you may be properly entered into the sweepstakes. Answer any questions the survey may ask about your most recent experience at Safeway. Answer any questions about your personal information, such as address, phone number, etc., so Safeway is able to contact you should you win. Hand write your full name, date of birth, address, city, state, zip code, telephone number, and email address on a sheet of paper. Note that mailed in entrances must be postmarked by the Saturday of that weekly drawing and received by the closing Friday of the same drawing. Should any other questions or concerns regarding the Safeway survey or sweepstakes occur, please feel free to contact Safeway.